Great outdoor dining set! Easy to assemble. Love the versatility of closing the table down to seat 8 when 12 is not needed. The chairs stack very nicely. Beautiful set! Urban Furnishing's 13 Piece Extendable Outdoor Patio Dining Set is a luxury modern outdoor patio dining set that offers trendy styling, clean lines, comfort and durability. The rectangular table is extentable from 86.6" to 130". This table offers plenty of room for dining and entertaning, while the chairs are extremely comfortable. Set comes with 12 chairs and chairs are stackable for easy storage. Table is constructed with a durable yet strong powdercoated aluminium frame with a matte frosted glass top. Chairs are also made from powdercoated aluminum with woven sling material. This dining set combination will be the center of attention for all your outdoor gatherings. 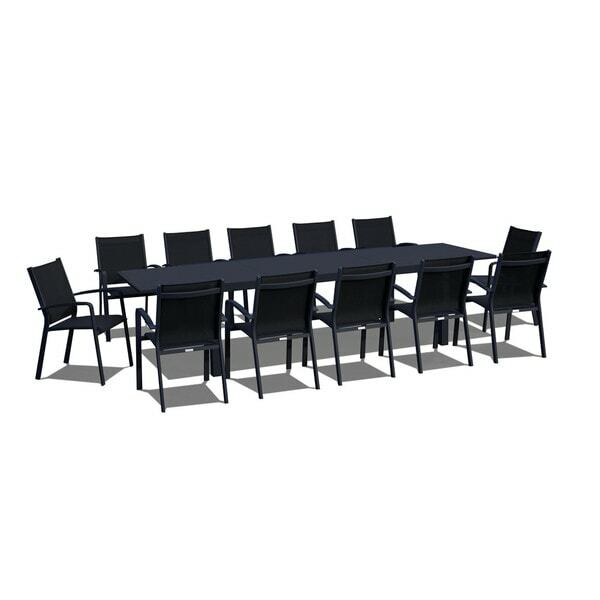 Table Dimensions: 36.2" W x 28.8" H x 86.6" L and extendable to 130.0"